Plant breeding has been going on for 10,000 years but technology –unmanned aerial vehicles (UAVs), robots, artificial intelligence (AI) and machine learning –is revolutionizing the practice. Plant breeding has been going on for 10,000 years, he said, but technology –unmanned aerial vehicles (UAVs), robots, artificial intelligence (AI) and machine learning –is revolutionizing the practice. Feeding the world’s population: It’s a huge challenge for plant breeders, he said, as well as researchers in other disciplines. Cornell is addressing it with the Cornell Initiative for Digital Agriculture(CIDA), which is leveraging digital innovations in agriculture to improve the sustainability, profitability, resiliency and efficiency of the world’s food systems. Gore is in the CIDA leadership group. Gore’s lab uses “rapid phenotyping” –the ability to non-destructively measure a plant’s morphological, physiological, and biochemical properties in real time repeatedly page 2–over the course of a growing season, as opposed to waiting until harvest. That could help reduce the time it takes to develop crop varieties that are optimal for a particular region or climate. Among other crops, Gore’s lab focuses on corn –including corn grown in upstate New York –and the development of variations that are best suited to the short growing season and weather conditions. 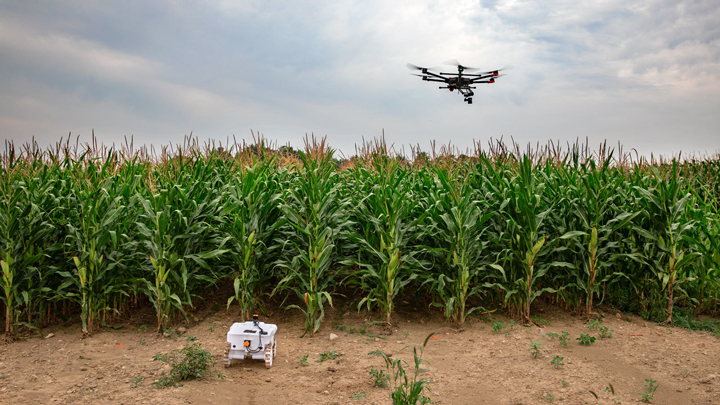 His lab employs camera-wielding UAVs –drones –and four-wheeled robots to perform real-time diagnostics of scores of corn varieties at the Musgrave Research Farm in Aurora, New York, about 24 miles north of campus. Gore’s team –in collaboration with the lab ofEd Buckler, adjunct professor of plant breeding and genetics –is developing AI for the autonomous vehicles that can count individual plants, measure plant height and check individual leaves for disease, among other tasks. And he can perform diagnostics on the plant at any point in its growth process. By using technology to detect key traits in midseason, Gore said, he can perhaps develop more precise breeding methods –and shorten the breeding timeline “from six to eight years, to maybe four or five” as the technologies are developed. He envisions a day when a robot or drone can not only facilitate rapid phenotyping, but also detect fungal diseases or weeds and immediately dispense a fungicide or page 3–herbicide in a precise dose, at just the right coordinate in the field. And while there will always be humans on a farm, Gore thinks a role-reversal could be in the offing. Developing a corn variety that’s best suited for upstate New York is one of many challenges Gore and researchers like him are tackling as thespecter of feeding 10 billion people looms.